The focus on spinal adjustment is what makes our doctors of chiropractic unique in their approach to treating patients with spinal complaints. The chiropractic adjustment, however, may not be the only procedure our chiropractors may employ in managing a patient's care. For example, chiropractic care has utilized drugless therapeutics (natural therapies) since as early as 1912. Natural agents such as heat, cold, water, massage, and exercise are some of the various therapeutic measures that are often utilized by chiropractors. When controlled, these and other elements exert a beneficial influence on body functions and can help a number of common pain problems. to help patients treat pain. Ice packs may be used to numb the pain for a 10 to 15 minute period and then switched with a heating pad, heat wrap or hot water bottle to restore blood flow to the area and promote faster healing. Exercise. 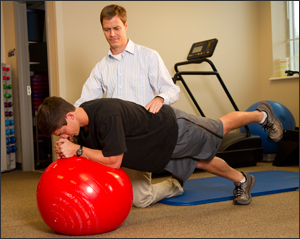 Our Chiropractors may provide patients with instructions for an exercise program focusing on stretching and strengthening the back. Massage. Our Chiropractors may massage the soft tissues to improve circulation, reduce swelling and inflammation associated with the pain, and encourage quicker healing. Or they may recommend the patient schedules a session wit one of our licensed massage therapists. Dietary management. Our Chiropractors will provide patients with tips on how an improved diet may help with their pain, and may recommend dietary supplements or a consultation with one of our weight loss coaches in conjunction with the spinal manipulations. Transcutaneous electrical nerve stimulators (TENS). The most common form of electrical stimulation, TENS units feature electrodes that are placed over the painful area with the user having the power to control the intensity of electrical stimulation. It is believed that TENS help block the transmission of pain signals along the nerves and also release the body's natural painkillers, endorphins. Traction. Our Chiropractors may use a traction device that stretch the spine, decompresses the discs and reduce the pressure on the nerve roots (a procedure known as non-surgical spinal decompression). Cold laser therapy. With cold laser therapy, particles of energy are carried in a laser and absorbed by the cell membrane's photo receptors after penetrating the skin surface. The cells and tissues then convert this light energy into biochemical energy, fueling a biological process that is believed to decrease swelling, reduce back pain and inflammation, and improve circulation. Ergonomics. During the course of chiropractic care, our doctors may recommend some modification such as a work station change that is applied at home and/or at work. The success or failure of obtaining patient satisfying outcome may be directly related to applying an ergonomic/job-related modification or a hobby-related irritating activity. Patient education classes. Our doctors will advise a variety of lifestyle modifications, including diet and nutritional programs, self-care and coping strategies, to the patient experiencing pain. By utilizing specific manipulations (chiropractic adjustments) in conjunction with one or a combination of the above, it is our chiropractor's goal is to remove structural or nervous system irritation that may be a major contributing factor in a patient's pain.